Building on Bochner's (1977) functional model for the development of overseas students' friendship patterns this study examines the friendship networks of international students attending long-term programs in Turkey concentrating primarily on their close friendships with host country nationals as well as facilitating and hindering factors of this friendship formation with a special attention to students' motivations which had led them to come to Turkey as one of the relevant factors. Our findings have confirmed a strong preference for co-national friendships and limited interaction with Turkish students. The lack of proficiency in Turkish language and a cultural distance (especially different religious background) were the most common reasons why closer bonds with Turkish students have not been formed. It has been also shown that the negative consequences of limited contact between both groups may go beyond the international students and an institutional intervention is needed. Therefore a design for a photography and storytelling project as a tool to increase cross-cultural communication is provided. The aim is to make Turkish students understand better the backgrounds of international students as well as to analyze the potential of similar initiatives to challenge the status quo. Annaberdiyev, D. (2006). Türkiye’de eğitim gören Türk cumhuriyetleri ve Türk üniversite öğrencilerinin psikolojik yardım arama tutumları, psikolojik ihtiyaçları ve psikolojik uyumlarının bazı değişkenler açısından incelenmesi. Yayımlanmamış yüksek lisans tezi, Ege Üniversitesi, Sosyal Bilimler Enstitüsü, İzmir. Bayraktaroğlu, S. & Mustafayeva, L. (2010). Türk yükseköğretim sistemi ve Türk dünyası ilişkileri: Sakarya Üniversitesi’nde eğitim gören yabancı uyruklu öğrenciler örneği, Journal of Azerbaijani Studies, 12(1-2), 284-292. Berry, J. W. (1992). Acculturation and adaptation in a new society. International Migration, 30, 69–85. Brown, H. D. (2000). Principles of Language Learning and Teaching (4th ed.). Addison Wesley Longman Inc.
Berry, J. W. (1997). Immigration, acculturation and adaptation. Applied Psychology: An International Review, 46, 5–68. Berry, J.W. & Kostovcik, N. (1990). Psychological adaptation of Malaysian students in Canada. In Abdul Halim Othman and Wan Rafaei Adbul Rahman (Eds), Psychology and socioeconomic development (pp. 155–162). Bangi, Malaysia: National University Press. Berry, J. W. (2005). Acculturation: Living successfully in two cultures. International Journal of Intercultural Relations, 29, 697–712. Bruch, T., & Barty, A. (1998). Internationalizing British higher education: Students and institutions. In P. Scott (Ed. ), The globalization of higher education (pp. 65–122). Buckingham: The Society for Research into Higher Education. Ercan, L. (2001). Yabancı uyruklu ve Türk üniversite öğrencilerine ait sorunların bazı değişkenler açısından incelenmesi. Hacettepe Üniversitesi Eğitim Fakültesi Dergisi, 21, 165-173. Furnham, A. & Alibhai, N. (1985). The friendship networks of foreign students: A replication and extension of the functional model. International Journal of Psychology, 20, 709-722. Furnham, A.F. & Bochner, S; (1982) Social difficulty in a foreign culture: An empirical analysis of culture shock. In: Bochner, S, (ed.) Culture in Contact: Studies in cross-cultural interaction. (pp. 161-198). Pergamon. : Oxford. Furnham, A., & Tresize, L. (1983). The mental health of foreign students. Social Science and Medicine 17, 365-370. Garabayev, B. (2000). Türkiye'de yüksek öğrenim gören Türk cumhuriyetleri öğrencilerinin uyum sorunları ve Türkiye ve Türklere ilişkin kalıp yargılar. Yayımlanmamış yüksek lisans tezi, Niğde Üniversitesi Sosyal Bilimler Enstitüsü, Niğde. Gareis, E. (2012). Intercultural friendship: Effects of home and host region. Journal of International and Intercultural Communication, 1–20. Güçlü, N. (1996). Yabancı öğrencilerin uyum problemleri. Hacettepe Üniversitesi Eğitim Fakültesi Dergisi, 12, 101-110. Hendrickson, B., Rosen, D., & Aune, R. K. (2011). An analysis of friendship networks, social connectedness, homesickness, and satisfaction levels of international students. International Journal of Intercultural Relations, 35, 281–295. Holstein, J. A., & Gubrium, J. F. (2004). The active interview. In D. Silverman (Ed. ), Qualitative research: Theory, method and practice (2nd ed., pp. 140– 161).Thousand Oaks, CA: Sage. Karaoğlu, F. (2007). Yabancı uyruklu öğrencilerde uyma davranışı:TÖMER örneği. Yayımlanmamış yüksek lisans tezi, Gazi Üniversitesi, Sosyal Bilimler Enstitüsü, Ankara. Kavak, Y. & Baskan G.A. (2001). Türkiye’nin Türk Cumhuriyetleri, Türk ve akraba topluluklarına yönelik eğitim politika ve uygulamaları, Hacettepe Üniversitesi Eğitim Fakültesi Dergisi 20(1): 92–103. Kıroğlu, K, Kesten, A & Elma, C. (2011). Türkiye’de Öğrenim Gören Yabancı Uyruklu Lisans Öğrencilerinin Sosyo- Kültürel ve Ekonomik Sorunları. Mersin Üniversitesi Eğitim Fakültesi Dergisi, 6 (2), 26-39. Kim, Y. Y. (2001). Becoming intercultural: An integrative theory of communication and cross-cultural adaptation. Thousand Oaks, California: Sage. Kimmel, K., & Volet, S. (2012). University students’ perceptions of and attitudes towards culturally diverse group work: Does context matter? Journal of Studies in International Education, 16(2), 157–181. Kondakci, Y. (2011). Student mobility reviewed: attraction and satisfaction of international students in Turkey. Higher Education, 62, 573-592. Kumcağız, H., Dadashzadeh, R. & Alakuş, K. (2016). Ondokuz Mayıs Üniversitesi’ndeki yabancı uyruklu öğrencilerin sınıf düzeylerine göre yaşadıkları sorunlar, Ondokuz Mayıs Üniversitesi Eğitim Fakültesi Dergisi, 35(2), 37-50. Lazarsfeld, P. F., & Merton, R. K. (1954). Friendship as a social process: A substantitive and methodological analysis. In M. Berger (Ed. ), Freedom and control in modern society (pp. 18–66). New York: Van Nostrad. Lee, P. (2006). Bridging cultures: Understanding the construction of relational identity in intercultural friendship. Journal of Intercultural Communication Research, 35, 3–22. Lindlof, T. R., & Taylor, B. C. (2010). Qualitative communication research methods (3rd ed.). Thousand Oaks, CA: Sage. Ng, K. T., Wang, K.W.Ch., & Chan, W. (2017) Acculturation and cross-cultural adaptation: The moderating role of social support. International Journal of Intercultural Relations, 59, 19–30. Otrar, M., Ekşi, H., Dilmaç, B. & Şirin, A. (2002). Türkiye’de öğrenim gören Türk ve akraba topluluk öğrencilerinin stres kaynakları, başa çıkma tarzları ile ruh sağlığı arasındaki ilişki üzerine bir araştırma. Kuram ve Uygulamada Eğitim Bilimleri, 2 (2), 473-506. Özçetin, S. (2013). Yükseköğrenim gören yabancı uyruklu öğrencilerin sosyal uyumlarını etkileyen etmenler. Yayınlanmamış Yüksek Lisans Tezi, Hacettepe Üniversitesi Sosyal Bilimler Enstitüsü, Ankara. Özoğlu, M., Gür, B.S. & Coşkun, İ. (2012). Küresel eğilimler ışığında Türkiye’de uluslararası öğrenciler. Ankara: Siyaset, Ekonomi ve Toplum Araştırmaları Vakfı. Paksoy, H. M., Paksoy, S. & Özçalıcı, M. (2012). Türkiye’de yüksek öğrenim gören yabancı uyruklu öğrencilerin sosyal sorunları: GAP bölgesi üniversiteleri örneği. Kahramanmaraş Sütçü İmam Üniversitesi İktisadi ve İdari Bilimler Fakültesi Dergisi, 2(2), 85-94. Redmond, M.V. & Bunyi, J.M. (1993). The relationship of intercultural communication competence with stress and the handling of stress as reported by international students. International Journal of Intercultural Relations, 17, 235–254. Rohrlich, B.F. & Martin, J.N. (1991). Host country and re-entry adjustment of student sojourners. International Journal of Intercultural Relations, 15, 163–182. Rogers, E. M., & Bhowmik, D. K. (1970). Homophily–heterophily: Relational concepts for communication research. Public Opinion Quarterly, 34(4), 523–538. Savaşan, F., Yardımcıoğlu, F. & Beşel, F. (2015). “Yabancı uyruklu lisans ve lisansüstü öğrencilerin sosyo-ekonomik problemleri: Sakarya Üniversitesi Örneği”, Uluslararası Öğrenci Sempozyumu, 6-8 Kasım, İstanbul, Türkiye. Searle, W. & Ward, C. (1990). The prediction of psychological and socio-cultural adjustment during cross-cultural transitions. International Journal of Intercultural Relations, 14, 449–464. Severiens, S. & Wolff, R. (2008). A comparison of ethnic minority and majority students: social and academic integration, and quality of learning. Studies in Higher Education, 33(3), pp. 253– 266. Soyutürk, M. (2000). Balkan ülkelerinden eğitim-öğretim için gelen öğrencilerin (Batı Trakya örneği) sosyal yapıya uyumları. Yayımlanmamış yüksek lisans tezi, Hacettepe Üniversitesi Sosyal Bilimler Enstitüsü, Ankara. Ujitani, E. (2006). Intercultural relational development between Australian and host Japanese students: A Longitudinal study of students’ socio-emotional experiences and interpretations. Australia: Murdoch University (Ph.D. thesis). Vural F.T.Y & Alkan S. (2009) Büyük öğrenci projesinin değerlendirilmesi (1992–2008). Ankara: Milli Eğitim Bakanlığı. Ward, C. (1996). Acculturation. In D. Landis, & R. Bhagat (Eds. ), Handbook of intercultural training(2nd ed.). Newbury Park, CA: Sage. Ward, C., Bochner, S. & Furnham, A. (2001). The psychology of culture shock (2nd ed.). London: Routledge. Ward, C. & Kennedy, A. (1993b). Where’s the culture in cross-cultural transition? Comparative studies of sojourner adjustment. Journal of Cross-cultural Psychology, 24, 221–249. Ward, C., & Kennedy, A. (1994). Acculturation strategies, psychological adjustment, and socio-cultural competence during cross-cultural transitions. International Journal of Intercultural Relations, 18, 329–343. Ward, C., & Rana-Deuba, A. (2000). Home and host culture influences on sojourner adjustment. International Journal of Intercultural Relations, 24, 291–306. Wilson, J., Ward, C., & Fischer, R. (2013). Beyond culture learning theory: What can personal tell us about cultural competence? Journal of Cross-Cultural Psychology, 44, 900–927. Wu H. P., Garza E., Guzman N. (2015). International student’s challenge and adjustment to college. Education Research International, 1-9. Yıldıran, C., Özkan, D. & Büyükyılmaz, O. (2016).Yabancı uyruklu lisans öğrencilerinin durum analizi: Karabük Üniversitesi. Uluslararası Bilimsel Araştırmalar Dergisi, 1(1), 20-34. Zimmerman, S. (1995). Perceptions of intercultural communication competence and international student adaptation to an American campus. Communication Education, 44, 321–335. Zhou, Y., Jindal-Snape, D., Topping, K. & Todman, J. (2008). Theoretical models of culture shock and adaptation in international students in higher education. Studies in Higher Education, 33, 63–75. ISNAD MREKAJOVA, Eva . "Friendship Networks of International Students Attending Long-Term Programs in Turkey: Implications and a Need for Intervention". 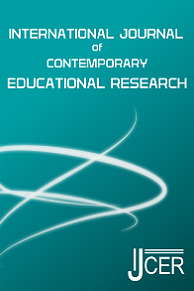 International Journal of Contemporary Educational Research 4 / 2 (December 2017): 26-38.